Exceeding the confines of a vast canvas through its spectacular assault of unrestrained expression, Untitled V of 1975 encapsulates the full force of Willem de Kooning's abstract vernacular. 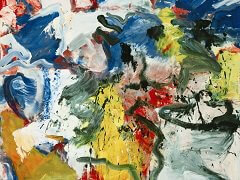 Through each visceral swathe, smear, drip and blow, the artist here asserts his total mastery of this medium. Indeed, the means of execution remain so compelling, so thoroughly captivating, that Untitled V stands as nothing less than the inescapable and irresistible culmination of the artist's output. 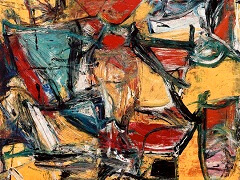 Executed in the year that de Kooning sensationally immersed himself in painting after a long absence, this work belongs to an explosive outpouring of creativity that produced an illustrious corpus of large-scale, color-saturated canvases that rank among the finest achievements of his prodigious career. Of this group, all produced in just six months, the present work is truly exceptional for the sheer force of its painterly conviction, the staggering variety of its luscious brushstrokes, emphatic mark-making and violent flecks of paint, all conveyed in the brilliant primary hues of an utterly seductive palette. While jagged cascades of serene blues fuse with cool fluid whites, searing reds and yellows surge across the surface to ignite the entire composition. Formerly an artist who famously scrutinized and reworked his canvases extensively, the confidence of the rapidly generated composition imbues Untitled V with an urgency that is still as affecting today as when it was first exhibited in New York almost forty years ago. This work has been held in the same private collection since 1989 and this occasion marks its first public appearance in over a third of a century. From 1969 de Kooning devoted himself primarily to sculpture, producing clay and bronze figures in his first foray into three-dimensional art. The tactile quality of sculpting was wholly sympathetic with de Kooning's sensuous approach to oil paint, as eloquently acknowledged in his famous 1950 quote, "Flesh was the reason oil painting was invented." 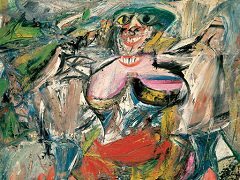 Within both mediums, de Kooning pressed the antithetical dialogue between improvisation and control, resulting in a gestural tension that animated his surface to the extreme. When sculpting, de Kooning often closed his eyes while working with clay, allowing touch and not sight to dictate the form. In similar fashion, the physical immediacy of Untitled V appears virtually to project off the picture plane and comprises a remarkably sculptural landscape of paint material. From 1975 de Kooning surrounded himself with his canvases, each inspiring him to paint another and informing all with the same sense of water, light and sky. Thick, lustrous paint flowed from his brushes, layering color upon color, as forms emerged and submerged in the textural paint surface. Indeed, the paintings of the mid 1970s, as perfectly epitomized by the present work, represent the most direct references to liquidity and flow in the artist's oeuvre. 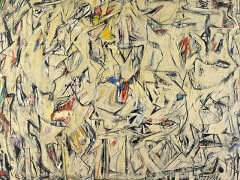 Here de Kooning forges a variety of planes of paint to coalesce in and out of each other across the canvas. While the impastoed surface is a signature characteristic of de Kooning's work of the 1950s, one of the revelations of de Kooning's later work, as in Untitled V, is the utter sophistication and variety of his paint handling. Focusing his energy on the quality of paint application and the texture of his surface, de Kooning thinned his oil paint with water, adding kerosene, benzene or safflower oil as binding agents. 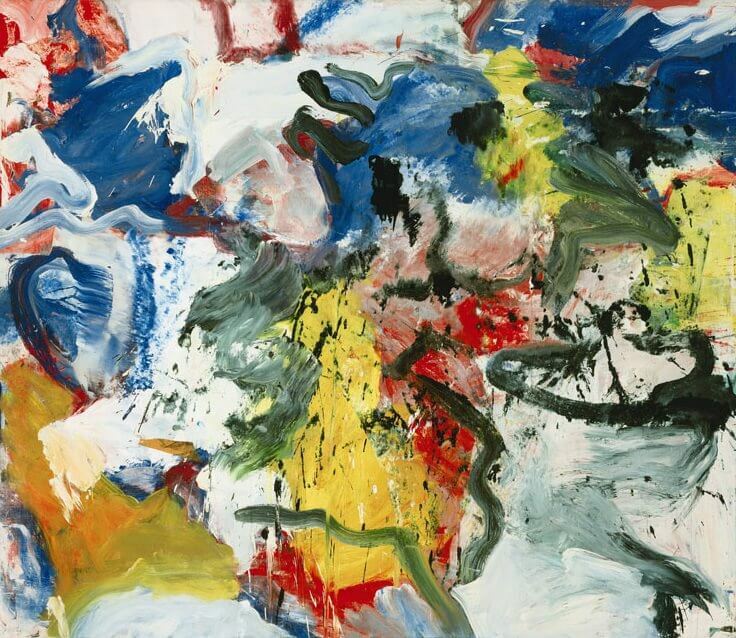 Using unorthodox methods of applying and removing paint with spatulas and knives, de Kooning defined his composition through gesture, energy and movement. While the expansive bursts of drips and paint flecks through the central section of Untitled V immediately evoke the method of Pollock, the quieter passages, created by scraping and smearing across fields of varying color pigment, foreshadow the beauty of Gerhard Richter's smeared Abstraktes Bild of the 1980s. 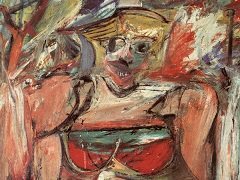 De Kooning's sense of line is of course critical to his entire aesthetic identity, and even during the period when he worked primarily on sculptures from 1969 to 1975, he continued to draw prolifically. 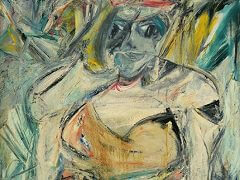 But with his return to the plastic form of paint, de Kooning's line is subsumed, as his strokes broaden and flatten. In place of line, both color and light serve as the organizing principles in this abstraction, reflecting his bright and open environment. 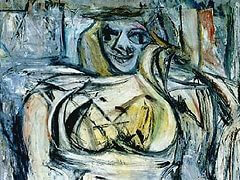 De Kooning was always an outstanding colorist, whether using a palette of black and white in the abstractions of the early 1940s or the pastel hues and acidic, jarring tones of his Women paintings and Urban Landscapes of the 1950s. But with his move to Long Island, de Kooning responded intimately not only to his oceanic surroundings, but to the elements of light and air. This newfound freedom of form, space and color was aptly described by Bernhard Mendews Burgi in the 2005-2006 exhibition of de Kooning's later decades at the Kunstmuseum in Basel: "the accumulation of sensations between earth and light and water and sky, distilled and detached from anecdotal experience, exploded in a rush of painting. What already applied to the abstract landscapes of the late 1950s and early 1960s became even more conspicuous in the series created between 1975 and 1980... They are not abstractions of the experience of nature; they are abstract in following an uncurbed energy principle without beginning and end, allowing things to emerge, to rise to the surface in analogy to nature... Everything seems to be floating, flying, lying and falling in these paintings, their energy heightened by a pulsating rhythm." (Ibid., pp. 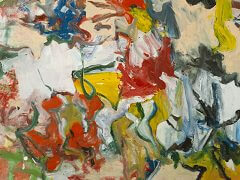 24-26) In shimmering light, forms dissolve and reform in a manner deeply akin to de Kooning's sense of abstraction. With this vibrancy of palette, coupled with the genius of paint handling and sure command of composition and form, Untitled V heralds the emergence of de Kooning as a wholly revitalized artist as he entered his seventh decade.